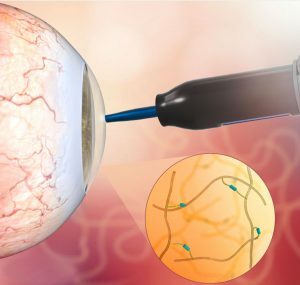 Engineers at the UCLA Samueli School of Engineering and their colleagues have developed an adhesive gel that can encourage the surface of the eye, known as the cornea, to heal itself following an injury. The new material could reduce the need for surgery to repair injuries to the cornea, including those that today would require corneal transplantation. 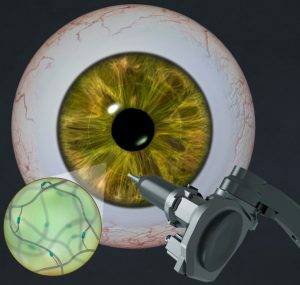 Artist’s concept of the adhesive being applied to an eyeball. Corneal injuries and infections are a common cause of visual impairment worldwide, with 1.5 million cases of blindness reported annually, according to the World Health Organization. One treatment option is a corneal transplant, but donors are few, and even then, transplanted tissues could be rejected. Other options include adhesives, however, current ones only act as a glue, rather than something that can heal corneal defects. In addition, these adhesives don’t stick well on a wet surface, such as the eye. The researchers’ new gel is clear and similar in density and structure to corneal tissue and can overcome these limitations. The co-lead author was Ehsan Shirzaei Sani, a UCLA Samueli graduate student and member of Annabi’s research group, which specializes in advanced biomaterials for tissue engineering. At first the material, called GelCORE, is clear and viscous enough to be applied from a dropper or syringe. Following a short exposure to visible blue light, the material hardens to a density similar to that of the cornea while remaining transparent. Corneal cells will gradually grow into the matrix-like material. GelCORE has the potential as a suture-less approach for the fast sealing of corneal wounds and to aid in long-term healing. The researchers are testing GelCORE as a platform to deliver different therapeutic agents to treat ocular diseases. The other principal investigator of the study was Dr. Reza Dana of the Massachusetts Eye and Ear center at Harvard Medical School. The co-lead author was Dr. Ahmad Kheirkhah, also of Harvard Medical School. Ali Khademhosseini, a UCLA professor of bioengineering and holder of the Levi James Knight, Jr., Chair in Engineering, was also an author of the study. The material was tested on eyeballs of rabbits. The research team plans to start human clinical trials next year. The research was supported by grants from the National Institutes of Health, the American Heart Association, the U.S. Department of Defense, a Research to Prevent Blindness Stein Innovation Award, and the Canadian Institutes of Health. Dana and Annabi are inventors on a patent application related to this work filed by the Massachusetts Eye and Ear Center and Brigham and Women’s Hospital.